Microsoft (MSFT) will report their fiscal Q1 results tonight after the close. The options market is implying only 4.5% tomorrow in either direction, which is nearly double the average move over the last four quarters. Shares of MSFT up a little less than 4% on the year are underperforming the major averages, with the S&P 500 up 6.25% and the Nasdaq Composite up 7.25% ytd. Wall Street analysts are overwhelmingly positive on the stock with 33 Buy ratings, and 2 Sell ratings with an average 12month price target 20% higher than current levels. But as we consider full-year guidance, and some of the headwinds that mega-cap tech multinationals like Apple and Intel have alerted us to recently, like the effects of a strong dollar, and most specifically a slowdown in China, I am hard pressed to think that MSFT, which gets half its sales outside the U.S. will be immune to such pressures. Additionally, unlike AAPL and INTC, MSFT trades at 23.6x expected FY19 eps growth of 13%, very near its richest valuation on P/E basis in a very long time. So what’s the trade? Frankly, I’d be very surprised if we saw a meaningful miss and guide down after the strength in their FQ4 and what appeared to be achievable guidance in late October. 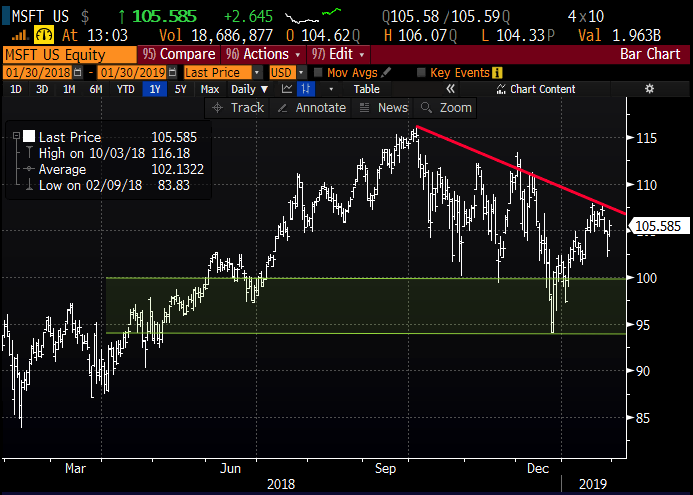 For those looking to fade pops in mega-cap tech (I am one), it might take a few days for investors to process AAPL’s guidance and commentary, and the Semiconductor Index’s resilience despite disappointments from Intel and Nvidia. Sometimes you just have to let things breathe a bit. 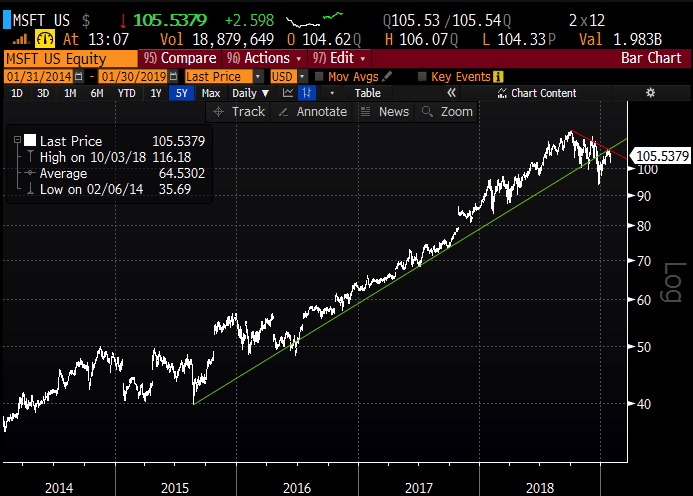 That said, despite the MSFT’s very recent underperformance, the stock has a sort of “priced to perfection” feel to it and if the company were to issue guidance that surprised, then the stock is quickly on its way back to the Dec lows. If they were to beat and raise the stock is likely up 4% or so in line with the implied move. Rationale: this trade idea risks 2% of the stock price with a breakeven down 2.5%. One would have to be very convicted that the company would miss and guide down to do this trade as it is quite binary, get the direction wrong and it will be a total loser by Friday morning. I frankly do not have that conviction.